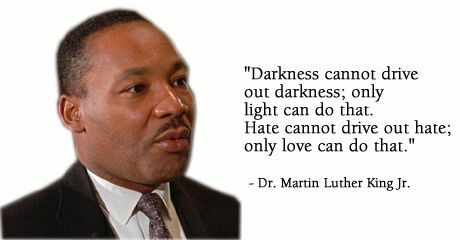 In honor of Martin Luther King, Jr’s Birthday, I would like to share one of my favorite quotes from my library of Mr. King’s quotes. I hope you enjoy & appreciate it as much as I do! Hatred paralyzes life; Love releases it! Hatred confuses life; Love harmonizes it! This entry was tagged facts, fresh pressed, humanity, identity, Inspiration, Life, Love, Me, MLKjr, Quotes, The commons. Bookmark the permalink. Hi ada. He was indeed a great man. This quote reflects his faith which was strongly based on Jesus’ commandment of loving your neighbor as yourself, loving God above all, and loving your enemies, praying for them and blessing them. How the world would be different, and a much better place, if this same philosophy was shared by all. Nice quote. Regards, eLFy.